Hogwarts School of Witchcraft and Wizardry is a British wizarding boarding school teaching the magical arts, located in Scotland inside Hogwarts Castle. The castle is in the mountains near a loch. The precise location of the school can never be uncovered because it has been rendered Unplottable. Similarly, most wizarding schools locations are protected in order to prevent their ways of teaching being revealed, as well as protect the students and schools themselves from any harm. 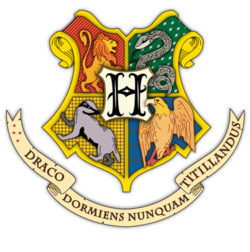 The school's motto is Draco Dormiens Nunquam Titillandus and is in Latin, which translates to "Never tickle a sleeping dragon". Hogwarts School is located in Hogwarts Castle, a large castle somewhere in Scotland. The castle has extensive grounds with sloping lawns, flowerbeds and vegetable patches, a loch (called the Black Lake), a large dense forest (called the Forbidden Forest), several greenhouses and other outbuildings, and a full-size Quidditch Pitch. There is also an owlery, which houses all the owls owned by the school and those owned by students. The three highest towers are the Astronomy Tower, the Ravenclaw Tower, and the Gryffindor Tower. There are 142 staircases, which are known to move, in the massive castle, which is set upon huge rocks above a magnificent lake. The castle is known for its many updates and changes in layout throughout the years, such as regenerating itself after the Battle of Hogwarts. It should be noted that some rooms in the school tend to "move around," and so do the steps on the grand staircase. Albus Dumbledore once stated that he did not know all of Hogwarts' secrets, as the castle has a long history and has witnessed centuries of ancient magic. The school has numerous charms and spells on and around it that make it impossible for a Muggle to locate it. Such people cannot see the school; rather, they see only ruins and several warnings of danger. Witches and wizards cannot Apparate or Disapparate in Hogwarts grounds, except when the Headmaster lifts the enchantment, whether only in certain areas or for the entire campus, so as to make the school less vulnerable when it serves the headmaster to allow Apparition. Electricity and electronic devices are not found at Hogwarts. Hermione Granger indicates that due to the high levels of magic, substitutes for magic used by Muggles, such as computers, radar and electricity "go haywire" around Hogwarts. Radios, however, make an exception. Rowling explains this by saying that the radios are not powered by electricity, but by magic. Hogwarts was founded around 990 A.D. by two wizards and two witches: Godric Gryffindor, Helga Hufflepuff, Rowena Ravenclaw, and Salazar Slytherin. They each represented an aspect of personality that they wanted to bring out in new students. However, shortly after founding the school, Slytherin had a falling out with the other founders about blood purity. Slytherin wanted to admit only pure-blood students, but the other three founders disagreed. Slytherin left the school, but not before secretly building the Chamber of Secrets. When his own true heir, the Heir of Slytherin, (the heir of Slytherin is Tom Riddle/Voldemort) returned to the school, he or she would be able to open the Chamber and unleash a murderous basilisk to purge the school of all Muggle-born students. About three hundred years after the school was founded, the Triwizard Tournament began between the three most prestigious magical schools in Europe: Hogwarts, The Beauxbatons, and Durmstrang. This tournament was considered the best way for wizards and witches of different nationalities to meet and socialise. The tournament continued for six centuries, until the death toll became too high, and the tournament was discontinued. The existence of the school was threatened twice when the Chamber of Secrets was opened. The first time it was opened was in 1942, when Tom Marvolo Riddle, the Heir of Slytherin and the man who would become Lord Voldemort, opened the Chamber in his fifth year. When a girl named Myrtle was killed, the Ministry of Magic threatened to close the school. As Riddle spent his time away from Hogwarts in a Muggle orphanage, he did not want the school closed (and having his request to remain in school over the holidays denied due to the situation he created), so he framed Rubeus Hagrid and dodged his crimes for decades. However, in 1992 the Chamber was reopened and the truth came out that Rubeus Hagrid was innocent and Riddle was guilty. In 1991, Harry Potter started at Hogwarts. Already being famous for being the boy who vanquished Lord Voldemort at the age of one, he soon began to unravel the secret of the Philosopher's Stone being kept at the school. Harry discovered that the Professor of Defence Against the Dark Arts, Quirinus Quirrell, was a host body for the barely alive Lord Voldemort, who wanted the Stone to restore him to his body and grant him everlasting life. Harry, Ron and Hermione suffered a series of difficult challenges down in the Underground Chambers in an attempt to stop the Philosopher's Stone being stolen by Severus Snape, who they believed was trying to steal it, when in reality it was Quirrell. Harry discovered Quirrell in the chambers, whom he was able to defeat and so thwart Voldemort from getting the Stone and returning to life. In 1992, the Chamber of Secrets was re-opened by Ginny Weasley, under the influence of a diary written by Riddle. The diary allowed Riddle's memory to possess Ginny, allowing him to act through her to open the Chamber a second time. Lucius Malfoy, through the desire to further the power of the Dark Lord, had slipped the diary into her bundle of schoolbooks, without knowing it was a Horcrux. His ulterior motive was to ruin the reputations of several great wizards, including Albus Dumbledore and Arthur Weasley, the latter of whom was highly influential concerning the Muggle Protection Act. However, Harry Potter discovered the truth and destroyed the diary and the basilisk, thus bringing an end to these dark plots. In 1993 Sirius Black escaped from Azkaban. Black had been in Azkaban for thirteen years, convicted of murdering twelve Muggles and Peter Pettigrew with a single curse. He was also convicted for turning James and Lily Potter in to Voldemort. It became apparent that Black was after Harry because he believed that killing Harry would bring Voldemort back to power. Black broke into the school twice, one time almost ripping the Fat Lady to shreds, and another time getting close to Ron Weasley's "rat," Scabbers. Harry, Ron, and Hermione met Black in The Shrieking Shack along with Remus Lupin, who had been a friend of Black during the time he attended Hogwarts as a student. Black revealed the truth to them. He was innocent, and it was Peter Pettigrew who had done the things Black had been convicted of. To blame Black he had chopped off one of his fingers as proof, turned into an Animagus, which in his case was a rat (Scabbers), and scurried off. Black had come back to kill Pettigrew, and now that Lupin had heard his story he believed him and was going to help. However, Pettigrew escaped and returned to Voldemort to help bring him back to power. Harry and Hermione helped Black escape on Buckbeak the Hippogriff while Ron was in the hospital wing, and saved both Black's and Buckbeak's lives. In 1994, the Triwizard Tournament recommenced with more powerful safety measures in place. However, more dark plots were being hatched. Barty Crouch Jr., disguised as Professor Alastor "Mad-Eye" Moody, managed to enter Harry in the Tournament by putting his name in the Goblet of Fire under the name of a fourth school, which ensured he would be chosen by the Goblet. Harry's involvement in this plan caused him great misery at Hogwarts, as the representatives for Beauxbatons and Durmstrang, as well as many Hogwarts students, believed he was a cheater. It was because of Crouch Jr. and his influence over certain house-elves that Harry ended up at the end of the tournament with Cedric Diggory (who, under Voldemort's order, was killed by Peter Pettigrew) in a graveyard surrounded by Death Eaters. Voldemort was brought back to his physical form using Harry's blood and a dark potion. Voldemort attempted to torture and humiliate Harry, but Harry escaped and succeeded in alerting all of Voldemort's enemies, Dumbledore in particular, that he had returned. Dumbledore restarted the Order of the Phoenix one hour after he was alerted. However, to the horror of all at Hogwarts, Cedric Diggory was murdered at the hands of Voldemort. Hogwarts was further threatened when the Ministry of Magic began implementing "Educational Decrees" in 1995, as part of a conspiracy to discredit and ruin Albus Dumbledore. Dolores Umbridge, the new Defence Against the Dark Arts teacher, was the centre of this plan. With these Educational Decrees, she slowly took control of Hogwarts, and eventually replaced Albus Dumbledore as Headmistress. But it was through the cunning of Hermione Granger and the members of Dumbledore's Army that Umbridge was overthrown. The Ministry had no choice but to accept that Voldemort had returned and Umbridge was removed from Hogwarts. Through the 1996-1997 school year, new Minister Rufus Scrimgeour ordered Aurors to guard Hogwarts for protection from Dark forces. In 1997, Hogwarts was attacked by a mob of Death Eaters. Student Draco Malfoy was forced into the service of Lord Voldemort for the fear of his and his family's lives. As a result, Headmaster Albus Dumbledore's safety was compromised, and he was killed by Severus Snape. Following this horrible tragedy, Professor Minerva McGonagall was appointed acting Headmistress, although the security of the school hung by a thread. There was no certainty that Hogwarts would remain open. The faculty agreed to follow "established procedures" and let the school governors ultimately decide. Regardless of the school governors' decision, with the takeover of the Ministry by Voldemort, attendance at Hogwarts was mandatory for all eligible children. New, militaristic requirements were established, such as proof of blood status. This was so Voldemort can keep an eye on the entire wizarding world from a young age, and to weed out muggle-borns, which included eleven-year old children who have no knowledge before the forced invitation, with the possibility of never entering Hogwarts nor returning to their homes ever again. Muggle Studies, involving mainly of how Muggles are vile things, became a required subject, while Defence Against the Dark Arts had simply become Dark Arts, teaching students illegal curses outright. Severus Snape was appointed Headmaster, and Alecto and Amycus Carrow, teachers of Muggle Studies and Dark Arts, respectively, have also been assigned as Snape's deputies. It was a time of great terror in which no one could be certain who was friend or foe. In May 1998, the Battle of Hogwarts took place. This battle ended with the death of many on both sides. Thanks to Harry Potter, Lord Voldemort was finally destroyed once and for all, and peace was restored, and Minerva McGonagall returned to her position as Headmistress and Harry was celebrated as a true hero. Hogwarts sustained extensive damage during the battle. Multiple areas of the main building and adjacent areas were set on fire or blown up, and the Quidditch pitch was largely destroyed by fire. Based on what is known since the time of the Battle, Hogwarts was repaired and open by 2017; Headmistress McGonagall had retired, the House System remained in place, many descendants of previous students were now coming to Hogwarts as new pupils, and Neville Longbottom became the Professor for Herbology after retiring as an Auror. Term begins on 1 September. Students usually reach Hogwarts via the Hogwarts Express, which leaves from Platform 9¾ of London's King's Cross Station at 11 a.m. sharp. There seemed to be other ways of entering the school, such as via brooms or Floo powder, or simply Apparating to a nearby location such as Hogsmeade. Missing the Hogwarts Express for any reason is a very serious problem but will not cost the student points as long as they get there before the term has officially started. The Hogwarts Express brings the students to Hogsmeade Station, where the first years traditionally cross the Black Lake in boats with the gamekeeper, and go under an opening in the rocks upon which Hogwarts is built, through a curtain of ivy, and finally into an underground harbour. Older students travel on the road in carriages pulled by thestrals (invisible to any that hasn't witnessed death) to the castle. The Welcoming Feast takes place in the Great Hall. This feast includes the Sorting ceremony, followed by a few words from the current Headmaster or Headmistress, the banquet starts after this, including large quantities of food and drink. The feast is closed with a few more words from the Headmaster, but it also included the usual "start-of-term notices". After dinner, students are led to their house common room by a prefect. This is a special time for new students to get comfortable with their surroundings, because the next day classes begin, 2 September. The class schedules are handed out during breakfast by the Heads of House. After two weeks of classes, the Quidditch team trials and flying lessons for the first years usually occur. Hogwarts' school year is structured in a similar way to other non-magical schools and colleges in the UK, with a three-term year punctuated by holidays at Christmas and Easter and bounded by the long summer holiday of nine weeks. Students have the option of staying at Hogwarts for the winter and spring holidays. Those who choose to stay at the castle do not have lessons and attend a feast on Christmas Day. Students also do not have classes the week of Easter, but this is much less enjoyable due to the large amount of work that the teachers assign students at this time in preparation for final exams. Other than the breaks and weekends, students do not receive holidays. However, students third year and above may visit Hogsmeade, the local village, occasionally. There are normally four feasts per year: the start-of-term feast at the beginning of the school year, end-of-term feast at the end of the school year, and feasts at Hallowe'en and Christmas. Feasts are also called to mark special occasions, as in Goblet of Fire, when there was a feast to celebrate the beginning of the Triwizard Tournament. Classes will proceed normally and the next notable event occurs on the evening of 31 October: the Hallowe'en feast. Decorations include giant pumpkins and flocks of hundreds of bats flying across the halls. The served foods include pumpkin treats, tarts, cakes and all sorts of magical sweets. The Quidditch season starts usually with the first Quidditch match in the first weeks of November. In the second week of December, the Deputy Head takes names of those who are staying at Hogwarts over the Christmas holidays. The first term usually ends about a week before Christmas and most of the students and some of the teachers go home by the school train. In Triwizard Tournament years, the Yule Ball occurs on the evening of Christmas Day, ending at midnight. On 25 December, a Christmas feast is held in the Great Hall. Shortly after 6 January (Epiphany aka Twelfth Night), the Hogwarts Express returns to Hogsmeade; the second term begins. The exact dates of the beginning of the Easter holidays vary every year. During these holidays, the students may go home. The final exams are held the first week of June and the results come out on the second week. In the evening before the Hogwarts Express goes back to London, the End-of-Term Feast is held. The Hogwarts Express returns to London during the third week of June. Some staff and all students leave Hogwarts for summer holiday. Hogwarts students are divided into four houses: Gryffindor, Hufflepuff, Ravenclaw, and Slytherin. Gryffindor is well known for bravery, daring, nerve, and chivalry. The house colours are deep red and gold, and the house is symbolized by a lion. The entrance to the common room is on the seventh floor hidden behind a portrait of the Fat Lady. In order to get into the common room, Gryffindor students must say the correct password. Hufflepuff is well known for loyalty, hard working, dedication, honesty, and tolerance. The house is symbolized by a badger, and the house colours are yellow and black. Its common room is near the kitchens. To get into the common room, rather than giving a password you must tap a fake barrel in the rhythm "Helga Hufflepuff." It is the only common room to have a way to keep students from other houses out (by dumping vinegar on them). Ravenclaw values wit, creativity, and wisdom. The house is symbolized by an eagle and the house colours are blue and bronze. The Ravenclaw common room is located in a high tower, and the interior is decorated with blue and bronze. To enter, rather than give a password, one must answer a riddle from an eagle door knocker, such as "Where do vanished objects go?" or "Which came first, the Phoenix or the flame?" Slytherin values ambition, cleverness, cunning, resourcefulness, and pure blood heritage. The house is symbolized by a serpent, and the house colours are green and silver. Its common room is located in the dungeons, underneath the Black Lake, and hidden behind a stone wall. The password for the 1992–1993 school year was "pure-blood". Many people believe students sorted into this house often get involved in the Dark Arts. Harry Potter, Ron Weasley, Hermione Granger, Albus Dumbledore, Minerva McGonagall, Rubeus Hagrid, James and Lily Potter, Sirius Black, Remus Lupin, Peter Pettigrew, Ginny Weasley, Lavender Brown, Parvati Patil, Neville Longbottom, Seamus Finnigan, Dean Thomas, Lee Jordan, Fred Weasley, George Weasley, Bill Weasley, Charlie Weasley, Percy Weasley, Katie Bell, Arthur Weasley, Molly Weasley, Andrew Kirke, Jack Sloper, Ritchie Coote, Jimmy Peakes, Angelina Johnson, Alicia Spinnet, Demelza Robins, Oliver Wood, Cormac McLaggen, Colin Creevey, Dennis Creevey, Romilda Vane, Nigel Wolpert, Mary Macdonald. Nymphadora Tonks, Pomona Sprout, Cedric Diggory, Justin Finch-Fletchley, Zacharias Smith, Hannah Abbott, Ernie Macmillan, Susan Bones, Leanne. Luna Lovegood, Moaning Myrtle, Penelope Clearwater, Cho Chang, Roger Davies, Michael Corner, Padma Patil, Anthony Goldstein, Terry Boot, Gilderoy Lockhart, Filius Flitwick, Quirinus Quirrell, Marietta Edgecombe, Marcus Belby. Tom Riddle, Draco Malfoy, Merlin, Lucius Malfoy, Bellatrix Lestrange, Vincent Crabbe, Gregory Goyle, Theodore Nott, Narcissa Malfoy, Regulus Black, Horace Slughorn, Severus Snape, Pansy Parkinson, Blaise Zabini, Millicent Bulstrode, Graham Montague, The Bloody Baron, Marcus Flint and Druella Black. Hogwarts' motto is: "Draco dormiens nunquam titillandus". The translation is: Never tickle a sleeping dragon. Quidditch is possibly the most popular sport at the school, with most of the student body turning out to watch each match. Hogwarts also has a Frog Choir which sings at special occasions. The highest position of staff at Hogwarts is the Headmaster or Headmistress. There is also a Deputy Headmaster or Headmistress, who will take over responsibilities of the Headmaster should the circumstances demand it. Hogwarts has in its faculty an abundance of wise and talented professors. Each specialises in a specific subject. Other staff positions include that of school nurse, caretaker, librarian, and Keeper of the Keys and Grounds of Hogwarts. There are a variety of classes taught at Hogwarts School of Witchcraft and Wizardry. These include both the core curriculum and the electives, available from third year forward. Some classes may be dropped in sixth year. Numerous lessons are described, instructing the students in various branches of magic. Transfiguration, Defence Against the Dark Arts, Charms, Potions, Astronomy, History of Magic, and Herbology are compulsory subjects for the first five years. At the end of their second year, students are required to add at least two optional subjects to their syllabus for the start of the third year. The five choices are Arithmancy, Ancient Runes, Divination, Care of Magical Creatures, and Muggle Studies. Transfiguration is the art of changing the form or appearance of an object, and hence this is what this class teaches. Transfiguration is a theory-based subject, including topics such as "Switching Spells" (altering only a part of some object, such as giving a human rabbit's ears); Vanishing Spells (causing an object to completely disappear); and Conjuring Spells (creating objects out of thin air). It is possible to change inanimate objects into animate ones and vice versa — Minerva McGonagall, the class's teacher, transfigures her desk into a pig. The teachers of the class have been Professor Albus Dumbledore (?-1957) and Professor Minerva McGonagall (1957-1998). Defence Against the Dark Arts, commonly shortened to D.A.D.A., is the class that teaches students defensive techniques to defend against the Dark Arts, and to be protected from Dark creatures. The subject has an extraordinarily high turnover of staff members — throughout Harry Potter's time at Hogwarts, no Defence Against the Dark Arts teacher has remained at Hogwarts for more than one school year. These included Quirinus Quirrell, Gilderoy Lockhart, Remus Lupin, Bartemius Crouch Jr impersonating Alastor "Mad-Eye" Moody, Dolores Umbridge, Severus Snape, and Amycus Carrow. Hagrid suggested that "They're startin' ter think the job's jinxed. No one's lasted long for a while now." Dumbledore suggested that Voldemort cursed the position because his application for it was rejected. The position had also been coveted by Snape, but he was denied the position as well. Snape was finally appointed D.A.D.A. professor in 1996. After the end of the Second Wizarding War, the jinx on the position was lifted. Harry Potter would occasionally come to the class to give lectures on the subject. The teachers of this class have been Professor Galatea Merrythought (c. 1895-1945), Professor Quirinus Quirrell (1991-1992), Professor Gilderoy Lockhart (1992-1993), Professor Remus Lupin (1993-1994), Barty Crouch Jr. (1994-1995), Professor Dolores Umbridge (1995-1996), Professor Severus Snape (1996-1997), and Professor Amycus Carrow (Dark Arts) (1997-1998). Charms the type of spell concerned with giving an object new and unexpected properties, and hence this class mainly consists on learning those sorts of spells. Charms classes are described as notoriously noisy and chaotic, as the lessons are largely practical. Many of the exposition sequences in the books are set in Charms classes, which are on the second floor of Hogwarts. The class is taught by Professor Flitwick (c. 1976-?, possibly before). Potions is described as the art of creating mixtures with magical effects. It requires the correct mixing and stirring of ingredients at the right times and temperatures. Snape's lessons are depicted as unhappy, oppressing times set in a gloomy dungeon in the basement of the castle, whilst Slughorn's, who replaces Snape as Potions Master, is shown as more cheerful and even fun at times. The teachers of this class have been Professor Horace Slughorn (?-1981) (1996-?) and Professor Severus Snape (1981-1996). Astronomy is the only field of study at Hogwarts that has a direct equivalent in the Muggle world. Astronomy classes take place in the Astronomy Tower, the tallest tower in Hogwarts, and are taught by Professor Aurora Sinistra. Lessons involve observations of the night skies with telescopes. Lessons are held every week at midnight, and first years have lessons on Wednesday. Known student homework activities include learning the names of stars, constellations and planets, and their location, movements, and environments. The only known teacher of this class is Professor Aurora Sinistra (c. 1991-?, possibly before). Arithmancy is a branch of magic concerned with the magical properties of numbers. As neither Harry nor Ron take this class, almost nothing is known about it. It is, however, a favourite subject of Hermione. Arithmancy is reportedly difficult, as it requires memorising or working with many charts. The subject is taught by Professor Septima Vector. It is separated into normal Arithmancy and Advanced Arithmancy Studies, the later of which is taught by an unknown teacher (possibly Professor Vector). The only known Arithmancy teacher is Professor Septima Vector (c. 1991-?, possibly before). The Study of Ancient Runes is a generally theoretical subject that studies the ancient runic scripts. Because only Hermione studies it, little else is known about this subject. It is taught by Professor Bathsheda Babbling (c. 1991-?, possibly before). History of Magic is the study of magical history. Cuthbert Binns' lessons are depicted as some of the most boring at Hogwarts. They are only lectures, given without pause, about significant events in wizarding history. Topics have included goblin rebellions, giant wars, and the origins of wizarding secrecy. This is the only class at Hogwarts that is taught by a ghost, as the professor never noticed he had died and simply continued teaching as if nothing had changed. The only known teacher of this subject is Professor Cuthbert Binns (17th or 18th century-?). Herbology is the study of magical plants and how to take care of, utilise and combat them. There are at least three greenhouses described in the books, holding a variety of magical plants of varying degrees of lethality. Herbology is also the only subject Neville Longbottom excels in. He later replaces Professor Sprout as the Herbology teacher. The known teachers of this subject are Professor Herbert Beery (?-early 20th century), Professor Pomona Sprout (early 20th century-early 21st century), and Professor Neville Longbottom (early 21st century-?). Divination is the art of predicting the future. Various methods are described, including tea leaves, Fire-omens, Crystal balls, Palmistry, Cartomancy (including the reading of conventional playing cards and the tarot), astrology, and Dream interpretations. Divination is described by Professor McGonagall as "one of the most imprecise branches of magic". Supporters of the subject claim that it is an inexact science that requires innate gifts like the "Inner Eye". Those opposed claim that the subject is irrelevant and fraudulent. Harry is first taught Divination by Professor Trelawney, and then later by Firenze after Trelawney is sacked by Dolores Umbridge in Harry's fifth year. In the sixth (and presumably seventh) year, Firenze and Professor Trelawney teach Divination. The teachers of this class have been Professor Sybill Trelawney (1980-1995) (1996-?) and Professor Firenze (1996-?). Care of Magical Creatures is the class which instructs students on how to care for magical beasts. Classes are held outside the castle. In Harry's first two years, the class is taken by Professor Silvanus Kettleburn who then retires "in order to enjoy more time with his remaining limbs". Dumbledore then recruits the gamekeeper Rubeus Hagrid to accept a teaching position along with his gamekeeping duties. Although Hagrid is obviously very experienced and knowledgeable, he consistently misjudges the risk that the animals he uses in his lessons pose to his students, which sometimes results in chaos. When Hagrid is absent, his lessons are taken over by Professor Grubbly-Plank, a witch and an acquaintance of Dumbledore's. The teachers of this class have been Professor Silvanus Kettleburn (early 20th century-1992), Professor Rubeus Hagrid (1993-? ), and Professor Wilhelmina Grubbly-Plank (1995). Muggle Studies is a class taught by Charity Burbage which involves the study of the Muggle (non-magical) culture "from a wizarding point of view." It also includes Muggle Art and Muggle Music. The only need for witches and wizards to learn about Muggle ways and means, is to ensure they can blend in with Muggles while needing to do so (for example, at the 1994 Quidditch World Cup). As the class is only mentioned as being taken by Hermione, and for just one year, little is known about its curriculum. Voldemort murdered Professor Charity Burbage because she portrays Muggles in a positive light and is opposed to limiting wizardry to only people of pure-blood origins. For the rest of that academic year, Alecto Carrow, a Death Eater, teaches Muggle Studies. However, her lessons (which are made compulsory) mainly describe Muggles and Muggle-borns as subhuman and worthy of persecution. The known teachers of this subject have been Professor Quirinus Quirrell (?-1990), Male Professor (1990-1993), Professor Charity Burbage (1993-1997), and Professor Alecto Carrow (1997-1998). Flying is the class that teaches the use of broomsticks made for the use of flying and is taught only to Hogwarts first years by Rolanda Hooch. The subject is the only one that requires physicality. The only teacher known to have taught this class is Professor Hooch. A subject taught by an unknown professor. It is assumed that students learn about ghouls like poltergeists, vampires, veela, etc. and how to defend themselves from these creatures. Alchemy is a sort of composite subject between Transfiguration, Potions and Muggle Chemistry, focused roughly on the transmutation of substances into other forms. It is an elective, only offered to NEWT level students if the demand is sufficient. Apparition is the magical form of teleportation in the wizarding world. Lessons are optional to those in the sixth and seventh years. In the wizarding world, performing Apparition requires a licence and may only be legally performed by people over seventeen years of age. The described reason for the restriction is that Apparition is dangerous if done improperly: insufficient concentration may lead to body parts being left behind in an unfortunate side-effect known as splinching. Although, as Hermione points out innumerable times throughout the series, magical enchantments on Hogwarts castle and grounds prevent Apparition and Disapparition inside the castle, these protections are temporarily relaxed within the Great Hall for short periods to permit students to practice Apparition. Wilkie Twycross, a Ministry of Magic Apparition Instructor, offers lessons in Apparition to sixth-years. Art is a class where students paint, draw, and otherwise depict artistic things (presumably controlling the paint and pencils with either a spell that repeats the same thing over and over or a spell that stands upright over the paper / canvas and draws in the direction that the wand moves) . It is taught by an unknown professor. Muggle Art is a class where students paint, draw, and otherwise depict artistic things. It is taught by an unknown Professor. Music is a class in which students are taught musical instruments and possibly sing in the Frog Choir. It was taught, in the early 1990s, by a male professor. A subject taught to at least first years. It is taught in Class 67 on the fourth floor of Hogwarts Castle. It presumably covers magic from a purely theoretical view, and Magical Theory by Adalbert Waffling may be a required textbook. Grading on routine homework seems to be along the same lines as that for Muggle students. Hogwarts students also have difficult exams as they progress higher in the system. O.W.L.s (Ordinary Wizarding Levels) are a set of standardised tests for fifth year students which determine what courses a student may continue to study in their final years at Hogwarts. N.E.W.T.s (Nastily Exhausting Wizarding Tests) are optional levels of education for exceptional students, much like A levels for Muggle students. To progress to N.E.W.T.-level, students must receive certain high marks on O.W.L. exams. N.E.W.T tests occur at the end of the seventh year and cannot be retaken. This grading system is also used on W.O.M.B.A.T.s (optional tests taken outside Hogwarts) and it is most likely used on N.E.W.T.s also, making this the universal exam grading system in wizarding Britain. A first year is a student at Hogwarts School of Witchcraft and Wizardry who is new to Hogwarts and in their first year of magical education. First years are typically eleven to twelve years of age. First years arrive at the castle by crossing the lake with the Keeper of the Keys in boats separate from the older students. They are not allowed to own a broomstick or be on one unless they are attending Flying class. An exception had been made for Harry Potter because he joined the Gryffindor House Team. First year classes consist of Potions, Herbology, Defence Against the Dark Arts, Transfiguration, History of Magic, Astronomy, Charms,and Flying. A second year is a student at Hogwarts School of Witchcraft and Wizardry who is in their second year of magical education. Second years are typically twelve to thirteen years of age, unless a student had to repeat the second form. The second year is the first year in which students are allowed, when arriving, to go with the rest of the school in the school carriages pulled by Thestrals up to the castle. Second year classes consist of Potions, Herbology, Defence Against the Dark Arts, Transfiguration, History of Magic, Astronomy and Charms. Unlike first years', the second-years' timetable does not include Flying, although they are allowed to bring their own broomsticks. At the end of the year, second year students choose two or more classes they wish to study as electives the following year. A third year is a student at Hogwarts School of Witchcraft and Wizardry who is in their third year of magical education. Third years are typically thirteen to fourteen years of age. The third year is an important one for students, as it is the first year that they are permitted to sit elective courses. Third year classes consist of Potions, Herbology, Defence Against the Dark Arts, Transfiguration, History of Magic, Astronomy, Charms, and the two or more electives the student chose the previous year. Third years are permitted to go to Hogsmeade during certain weekends if they have a signed permission form from their parent/guardian. A fourth year is a student at Hogwarts School of Witchcraft and Wizardry who is in their fourth year of magical education. Fourth years are typically fourteen to fifteen years of age. The fourth form is almost identical in its structure to the third; students sit two or more elective courses in addition to the core classes, and are allowed in Hogsmeade during selected weekends. Fourth year classes consist of Potions, Herbology, Defence Against the Dark Arts, Transfiguration, History of Magic, Astronomy, Charms, and two or more electives. Although, fourth years typically get more work than third years, to prepare for their O.W.L.s. A fifth year is a student at Hogwarts School of Witchcraft and Wizardry who is in their fifth year of magical education. Fifth years are typically fifteen to sixteen years of age. The fifth year is enormously important for students, due to the fact that it is the year in which they must sit their O.W.L. exams, which will determine what N.E.W.T. courses they will be permitted to take later on in their education. O.W.L.s determine what jobs they can apply for in their future careers. The fifth year is also the year in which students receive career counseling from their Heads of House. It is during this meeting that they will be advised as to what N.E.W.T.-level classes they should take in order to qualify for their desired career. Fifth year classes consist of Potions, Herbology, Defence Against the Dark Arts, Transfiguration, History of Magic, Astronomy, Charms, and two or more electives. Before the beginning of the year, one boy and one girl are selected by the Headmaster from each house to become prefects. A sixth year is a student who is in his or her sixth year of magical education at Hogwarts School of Witchcraft and Wizardry. Sixth years are typically sixteen to seventeen years of age, although some may be older, if they have had to repeat a year like Marcus Flint did. The sixth year is the first year in which students sit N.E.W.T.-level classes. Based on their O.W.L. scores, and depending on the minimum requirements of the professor teaching the subject at that time, students are allowed to sit any number of classes as long as they meet said requirements. If the student doesn't meet those requirements, they cannot attend the N.E.W.T.-level classes, having to repeat the O.W.L.-level classes and the fifth-year exams. While students do have the opportunity to choose whether they wish to continue in particular subjects, those who begin studying N.E.W.T.-level subjects in their sixth year are expected to carry on with the subject into the seventh year, and sit the N.E.W.T. exam in that subject. Sixth year students are initially excited to have more free time, but this extra time is intended to help them study and do homework, as many, if not all, teachers assign more homework and give more difficult lessons in their N.E.W.T.-level classes. Sixth years may also elect to take part in Apparition lessons for a fee of twelve Galleons. A seventh year is a student at Hogwarts School of Witchcraft and Wizardry who is in their seventh and final year of formal magical education. Seventh years are typically seventeen to eighteen years of age, although some may be older if they have had to repeat a year. The seventh year contains the most important exams given at Hogwarts - the N.E.W.T.s. Students conclude their N.E.W.T.-level studies in the seventh year, at the end of which they sit the N.E.W.T. exam pertaining to each of their subjects. A student in the seventh year would have the same schedule he or she had in the sixth year, and would sit only those classes in which they received O.W.L.s meeting the minimum requirement of the professor for that subject. However, not all students take N.E.W.T.s, as some occupations require only O.W.L.s. Every year, a male and female seventh year are appointed Head Boy and Head Girl. In most cases the Headmaster selects the Head students from the seventh year prefects. However students that have never been prefects, for example James Potter, can still be selected. The day begins at 7:30 a.m. with breakfast in the Great Hall. During breakfast, the mail arrives in a flurry of hundreds of owls. A bell chime signals the start of the first class at 9 a.m. The bell chimes again in one hour to signal the start of the next class. There are four class periods before lunch (though NEWT student may have breaks during some of these), scheduled according to house. After lunch, there is another break and two more classes. Dinner is served in the Great Hall toward evening, after which the students are expected to be in their house common rooms for studying and socializing. There is an Astronomy class at night on Wednesday every week (usually midnight). Each year, the Hogwarts Deputy Head sends letters to eligible witches and wizards who will be eleven years old. These letters invite the children to be students at Hogwarts. If for any reason a letter does not reach its intended recipient, owls will continue delivering letters until the person receives one (as was Harry Potter's experience when he turned eleven). The letter contains a list of needed supplies, signed by the Chief Attendant of Witchcraft Provisions, Lucinda Thomsonicle-Pocus, which includes uniform clothing, spell books, and cauldrons. Letters are also sent to existing students to inform them of the new supplies needed. Students usually obtain school supplies at Diagon Alley in London. Letters to Muggle-born witches and wizards, such as Hermione Granger and Lily Evans (and Tom Riddle and Harry Potter, though half-bloods, who lived with Muggles and knew nothing of the wizarding world), who may not be aware of their powers and are unfamiliar with the concealed wizarding world, are delivered in person by a member of Hogwarts staff, who then explain to the parents/guardians about magical society, and reassure them regarding this news. They also assist the family in regards to buying supplies and gaining access to Diagon Alley. Harry Potter's letter was sent via normal owl delivery, since the Headmaster, Albus Dumbledore, had presumed that the Dursleys had explained to Harry about Hogwarts and the wizarding world. When no response came from the first, several more letters, each reflecting Harry's new location, were sent. Ultimately, Rubeus Hagrid, Hogwarts' Keeper of Keys and Grounds, was dispatched to hand-deliver Harry's final letter. Once he found Harry, who was with the Dursleys in their vain attempt to keep all wizarding knowledge from Harry, Hagrid explained all about Harry's parents and what had really happened the night they died. Students are allowed to bring a cat, an owl or a toad, but many exceptions such as rats and Pygmy Puffs are made. Tryouts for house Quidditch teams happen at the very beginning of the school year. First years are usually prohibited from joining a Quidditch team because they are usually inexperienced with brooms and are forbidden to own them in the first place. However, exceptions have been made on both counts. Students may go home for certain holidays such as Christmas and Easter. The students who choose to remain are treated to a feast along with some of the faculty. When Christmas holidays end, classes begin again. In Harry Potter's second year, Gilderoy Lockhart organised a Valentine's Day celebration. It was not continued after he left the school. The Easter holidays are not as enjoyable as the Christmas ones, as students are overloaded with homework in preparation for their exams, which are taken at the end of the year. Students are not allowed to use magic over the summer holidays until they turn seventeen, magic is also banned in corridors. The students at Hogwarts School of Witchcraft and Wizardry are required to wear a uniform. Students must wear their uniforms during all lessons, and while eating meals or studying in the Great Hall. Students are allowed to wear their own clothes after lessons in their house dormitory and during the holidays. Most students are seen still wearing their uniforms in their house dormitory, most probably because they would need to change into their pyjamas to sleep before they go to bed, so they may feel that it is troublesome to change into their own clothes, then change again into their pyjamas. The Hogwarts uniform worn in the books consists of a black robe and a black pointed hat. The robes bear no marks to distinguish between the houses. Students wear their own socks and shoes. The uniform portrayed in the films consists of a white collared, long sleeved shirt, a tie of their house colours (getting more sophisticated each year), a grey jumper vest, black slacks for males and a black, knee length skirt for females paired with black or grey socks. Both genders wear black comfortable shoes. Each student wears a cloak that bears their house crest on the front, right side and has lining of their house colour: green for Slytherin, red for Gryffindor, blue for Ravenclaw, and yellow for Hufflepuff. During the winter months, a grey jumper replaces the jumper vest for comfort and a scarf bearing their two house colours is worn for warmth. A black pointed hat is provided, but is only worn for special occasions such as the opening ceremony, special dinners, house cup ceremony etc. J. K. Rowling speculated that she might have subconsciously produced the name Hogwarts from the Hogwort plant she saw when walking round Kew Gardens. In the film Labyrinth, Sarah, acted by Jennifer Connelly, meets a goblin outside the gates of the Labyrinth who introduces himself as Hoggle. As they depart, she calls him "Hogwart" instead of his proper name, Hoggle. Also in the film Labyrinth, Jareth the Goblin King, acted by David Bowie, often calls his goblins by the wrong names and at one point he incorrectly calls Hoggle "Hogwart." It is of course possible that the name may have derived from the word "Warthog", but simply reversed. J. K. Rowling said she wanted a humorous motto for Hogwarts, since so many schools have less pragmatic ones such as "Reach for the stars". The school song is only sung in the first book, and partially by Hermione and Hagrid in the fourth film. However, the song is sung completely in the deleted scenes as a welcoming to the students of Beauxbatons and Durmstrang. Credited to one of the many eccentricities of Albus Dumbledore. A board game called Destination Hogwarts is based off the school and castle. In the Harry Potter and the Philosopher's Stone video game, a Muggle Studies Classroom is featured on the fifth floor, and an Ancient Runes Classroom is on the sixth floor. In Harry Potter and the Half-Blood Prince, Dumbledore believes that Hogwarts is the place Tom Marvolo Riddle felt was his real home. Ironically, this is also how Harry Potter felt about Hogwarts which is why it was stated that Harry's stomach lurched when Dumbledore told him this. According to Remus Lupin, attendance at Hogwarts by British students is not mandatory; they may be home schooled by their parents, or sent to another magical school(this rule was changed during the 1997–1998 school year, but was presumably restored after the demise of Voldemort). It is likely this extended to Lucius Malfoy's also expressed interest in his son attending the Durmstrang Institute. There are two Headmasters known to have held the title more than once; they were Minerva McGonagall and Albus Dumbledore. It is rumoured that on the W.O.M.B.A.T. test, Rowena Ravenclaw had a dream that a warty hog was leading her to a lake and that's how Hogwarts got its name. J.K. Rowling has said in an interview that Hogwarts is a multi-faith school, and later confirmed that every "religion/belief/non-belief system" is represented at Hogwarts other than Wicca, as she felt this was a "different concept of magic" as compared to that taught at Hogwarts. The Anti-Disapparition Jinx was lifted in 1998 as Draco Malfoy could apparate to Blaise Zabini and Gregory Goyle. How Many Students Are There At Hogwarts?, by Steve Vander Ark. ↑ "Hogwarts. It is the finest school of Witchcraft and Wizardry in the world and is run by the finest Headmaster Hogwarts has ever had, Albus Dumbledore. Logically it had to be set in a secluded place, and pretty soon I settled on Scotland in my mind." Fraser, L., An interview with J.K.Rowling, Mammoth, London, 2000. ISBN 0-7497-4394-8. pp 20–21. ↑ J.K. Rowling (@jk_rowling) on Twitter: To everyone asking whether their religion/belief/non-belief system is represented at Hogwarts: the only people I never imagined there 1/2 and are Wiccans. ↑ J.K. Rowling (@jk_rowling) on Twitter: . @GredxForgex Me too! But it's a different concept of magic to the one laid out in the books, so I don't really see how they can co-exist. This page was last edited on 17 July 2015, at 12:04. This text is available under the GNU FDL and may have been adapted from the Wikipedia article about Hogwarts School of Witchcraft and Wizardry (history).